In honour of Super Bowl Sunday, I made a big batch of delicious chili. I followed this great recipe, but made a few modifications. Finally added some yellow pepper to the green, and since I don’t think chili is really chili without it, I added about half a teaspoon of cumin to spice it up a bit. Your chili sounds divine and I made some chili too but with cubed pork tenderloin for the meat and I added about 2 cups of frozen mixed vegetables to the onions, garlic, celery, carrots, beans and canned whole tomatoes in their juice. I began with olive oil to saute all the veggies and I added chicken broth and used salt, a bay leaf, black pepper, cayenne, oregano, thyme and a glass of port wine for a little twist. It simmered for about 2 hours and it was delicious with homemade garlic bread and a tablespoon of double cream. 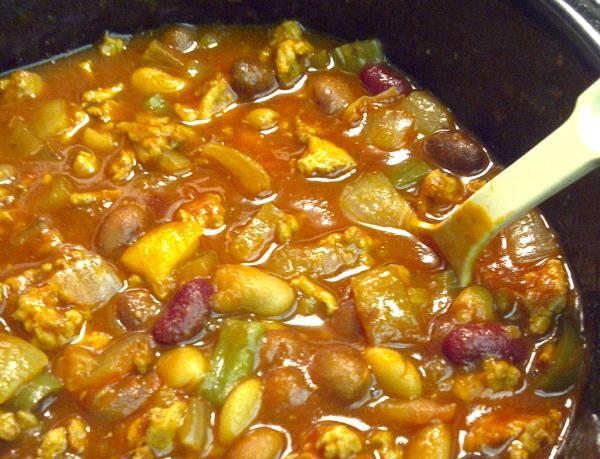 There is something about chili that is so refreshing for me and that is that it is always a new recipe because you begin and end with your own choice of ingredients. The point is to have a smooth, hot and spicy combination of flavours that is a whole meal in a bowl and with a bread of your choice it is very satisfying. Thanks for great recipe Amanda! I’ll try it when (hopefully) the new football season kicks off!